The half-mythical creature of the forbidding black depths of Scotland's Loch Ness has attracted fame and attention from all around the globe. Cryptozoologists and legend-seekers have been searching the waters of the loch for evidence of her existence for decades. Here and there, a murky shadow will appear in a photograph, or an unexplainable reading will cross a sonar machine to remind dedicated Nessie enthusiasts not to give up their search for the monster. 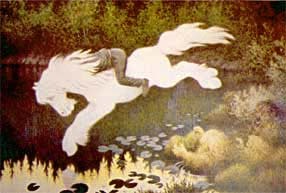 Scottish folklore is full of descriptions of beasts inhabiting its lochs and rivers. 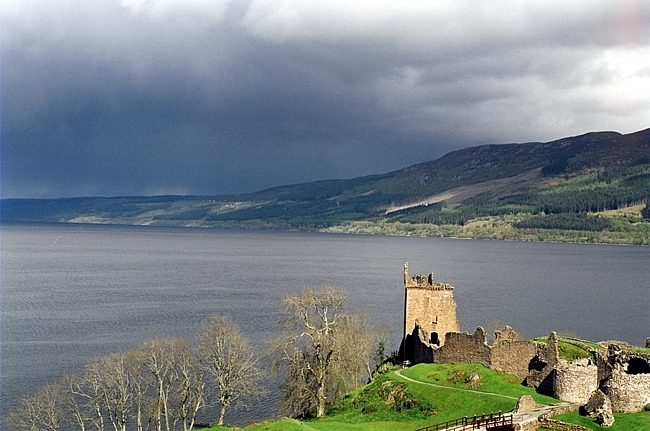 Loch Ness, however, is especially rich in animal lore: with a square surface area of 56.4 square kilometers and a depth of 230 meters, Scotland's largest loch is full of hiding places. According to local legend, the loch was formed when a woman forgot to cover the well from which her little community drew its water, despite the dire warning their Druid priest had issued about immediately covering the well after water was drawn. As the woman walked away, a geyser of water spouted into the sky, and within moments the entire valley had flooded. The earliest report of a monster associated with the Loch Ness vicinity appears in Adomnan's seventh century biography of Saint Columba. Adomnan tells us that Columba was with a small number of his companions when he came across some local young men who were burying a friend by the River Ness. When Columba asked what the cause of death had been, they replied that their friend had been swimming in the river when a water beast attacked him. The men watched the creature drag their friend under and rushed in their boat to save him; but by the time they got to him, they could only drag up his mangled corpse. After the young men had related their story, Columba asked them to point out the exact location they had seen the beast. The holy man asked to borrow their boat and put one of his companions in it. The others, terrified, begged him to keep their friend ashore, but he would not be swayed. They watched in stunned silence as the young man rowed to the middle of the river, amazed at the trust he had placed in his teacher. As the boat approached the middle of the river, the great beast sprang from the water and prepared to attack. Columba stood tall at the shore and made the sign of the cross. "Go no further," he bellowed to the beast. "Do not touch the man, or any man ever again. Go back from where you came at once!" As if pulled back by ropes, the monster suddenly jerked back and fled from the boat as though in terror. On shore, both Columba's companions and the group of young men praised God for the miracle that they had witnessed. No one was ever harmed by a creature around the River Ness again. This creature in the Saint Columba story was at first described as a kelpie, a monstrous creature that lived underwater. The kelpie would appear to weary travelers in the form of a bridled horse and entice them with the offer of a ride. When the victim mounted the beast, it would revert into its original form and plunge into the loch to drown and devour its unfortunate prey. Kelpies were common figures in the Scottish bestiary; the biographies of medieval saints abound with tales of their encounters with water beasts. Adomnan's tale became attached to the Loch Ness monster legend retrospectively by believers to bolster claims of the creature's existence. The legend of the Loch Ness monster was born in the summer and spring of 1933 when over a dozen people reported seeing a strange creature around the loch. All the accounts agreed that it was a large animal with grayish skin and a long neck. Some witnesses reported that they had seen one or two humps on its back, while others claimed it had webbed feet or flippers. With its huge network of lochs and rivers, Scotland's locals were not usually astounded beyond belief when some never-before-seen marine creature washing up on their shores. This particular creature, however, began to attract wider interest after motorist George Spicer described watching "the nearest thing to a prehistoric animal that I have ever seen" as it crossed the road about two hundred meters in front of his car in July 1933. Nessie jumped into the international spotlight after Alex Campbell, a water bailiff living in Fort Augustus at the south-western edge of the loch, interviewed a Mrs. Aldie MacKay about a "whale-like" creature she had seen in the narrows at Aldourie Castle in the summer of 1933. 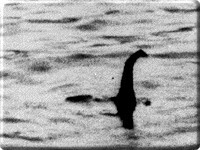 Being an amateur journalist, Campbell wrote an article he titled "Strange Spectacle on Loch Ness," and sent it to the Inverness Courier. In the article, he had changed the adjective Mrs. MacKay had used to describe the creature, "whale-like," to a more exciting "monstrous." When the London presses on Fleet Street heard about a "monstrous creature" on Loch Ness, its journalists jumped at the chance to head north for a "jolly" with the locals. The legend was born. Solid evidence for the existence of such a monster surfaced in 1934 in the form of a photograph allegedly taken by Robert Kenneth Wilson, a London doctor. The picture shows a shadowy head and neck sticking out of the water, surrounded by ripples as though it were moving. It was published in the Daily Mail on 21 April 1934 as "The Surgeon's Photograph," because Wilson refused to attach his name to it at the time. After conducting several detailed analyses of the photo's uncropped negative in the 1970s, researchers discovered that the iconic image was a hoax, although they could not determine exactly what it was they were looking at. Finally, in 1994, Christian Spurling went public. Spurling, a sculptor, admitted that he had crafted the specimen in the photograph by attaching a head and neck crafted from plastic wood to a toy submarine. He had been in cahoots with his father-in-law, Marmaduke Wetherell, a big game hunter who wanted to get revenge on the Daily Mail for publicly humiliating him by exposing the "Nessie footprints" he had donated to the British Museum as the plaster casts of his hippo-foot ashtray they really were. Wetherell had recruited his insurance agent, Maurice Chambers, to ask Robert Kenneth Wilson to offer the photographs to the paper. Contemporary Nessie-seeker Henry Bauer doesn't buy the hoax story. He claims that the "debunking" of the Surgeon's Photograph is merely evidence of skeptical bias, asking why the perpetrators waited sixty years to reveal their hoax if the purpose was to embarrass the Daily Mail. 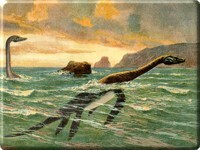 Nor does Alistair Boyd, one of the researchers who uncovered the hoax, believe that a faked photograph is cause enough to dismiss other evidence of Nessie's existence. 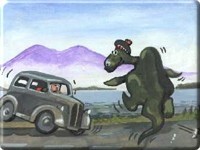 Since the 1930s, tourists have been flocking to Loch Ness in hopes of seeing the fabled beast for themselves. Many people captured still or moving images of some unidentifiable thing in the water; on further examination, however, these pictures usually turned out to be of boats, shadows, or seals or otters. Explorers also tried to locate the monster using sonar, but these too proved to be either inconclusive or negative. Then, in December 1954, the crew of the fishing boat Rival III observed sonar readings of a large object keeping pace with the boat at a depth of 146 meters. The object traveled for 800 meters with the vessel in this manner before contact was lost. The 1993 documentary Loch Ness Discovered featured detailed analyses and digital enhancements of many of these older photographs and films. One video, captured in 1960 by aeronautical engineer Tim Dinsdale, showed a hump crossing the water in a powerful wake, unlike that of a boat. The technician who enhanced the film noticed a shadow in the negative that had not been obvious in the positive. By enhancing and overlaying the frames, he found what appeared to be a tail, rear flippers, and an additional hump or two on a plesiosaur-like body. The film's camera and lighting angles make it unlikely that the images were underwater shadows. "Before I saw the film, I thought the Loch Ness Monster was a load of rubbish," he admitted on camera. "Having done the enhancement, I'm not so sure." In 1962, the Loch Ness Phenomena Investigation Bureau, a UK-based society, formed to study the loch and either identify the Loch Ness Monster or to determine the causes of misidentification. The society existed for ten years and attracted over one thousand members, including Member of Parliament David James, who was one of its founders. In 1968, D. Gordon Tucker, Electronic and Electrical Engineering Chair at the University of Birmingham volunteered his services to the society as a sonar expert. 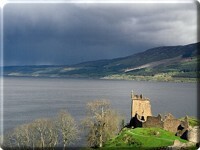 Tucker used Loch Ness as a test site for a prototype sonar transducer with a maximum range of 800 meters. Tucker's team fixed the device underwater at Temple Pier in Urquhart Bay and directed towards the opposite shore, its acoustic "net" drawn across the width of the loch so that no moving object could pass through it undetected. Over the course of the two-week trial, the device identified multiple animate targets 6 meters in length ascending from and diving to the bottom of the loch at speeds of up to 10 knots, or 19 kilometers per hour. Tucker and his team concluded in a press release for the LNPIB: "The high rate of ascent and descent [of these targets] makes it seem very unlikely that they could be fish, and fishery biologists we have consulted cannot suggest what fish they might be. It is a temptation to suppose they might be the fabulous Loch Ness monsters, now observed for the first time in their underwater activities!" Inspired by Tucker's findings, field researcher for the New York Aquarium in New York City, Andrew Carroll, conducted a submersible mobile sonar scan at Loch Ness in October 1969. During one sweep of the loch, the team detected a strong, animate echo for nearly three minutes. The intensity of the retuning echo was twice as great as what would be expected from a three meter pilot whale. University of Chicago biologist Roy Mackal scrutinized Carroll's sonar data and confirmed that an object with dimensions of 6 meters had been contacted. Mackal went to Loch Ness himself in 1970 to search for the cause of the mysterious sonar data using a system of underwater microphones deployed at various intervals throughout the loch. Two days of recording collected some "bird-like chirps" near the bottom of the loch. Another test in Urquhart Bay revealed knocks and clicks indicative of echolocation, followed by a "turbulent swishing" suggestive of the tail locomotion of a large aquatic animal. Mackal concluded that the knocks, clicks, and swishing were the sounds of an animal using echolocation to capture prey. But these recordings did not correspond with sounds produced by any identifiable animal, as such calls were not within the anatomical capabilities of the loch's known resident life forms. In 1972, Robert H. Rines, president of the Academy of Applied Science, teamed up with LNPIB to conduct a sonar scan of the loch. Using underwater time-lapse cameras loaned by the Massachusetts Institute of Technology, Rines captured images that corresponded with sonar activity. Despite the murky quality of the pictures, several of them seemed to show an animal resembling a plesiosaur in various positions and lighting. British naturalist Peter Scott announced in 1975 that the scientific name of the creature captured in the photographs would henceforth be Nessiteras rhombopteryx (the Ness monster with diamond-shaped fin), basing this name on a few close-up pictures of the creature's supposed diamond-shaped flippers. Scottish politician Nicholas Fairbairn, however, was quick to point out that the name was an anagram for "monster hoax by Sir Peter S." Scott retaliated by stating that if he were going to do such a thing he would have incorporated the other four letters of his surname. Discovery Communications began an ecological survey of the loch in 1993. While studying the loch's nematodes and fish, the research team encountered three sonar contacts followed by powerful wakes. The team's discoveries were featured on the documentary Loch Ness Discovered, along with analyses of the Surgeon's photo, the 1960 Tim Dinsdale film, and Robert Rines' flipper photos. Robert Rines continued his search for the Loch Ness monster into the new millennium. In 2008, however, he expressed fear that the monster may have died, citing a lack of recent significant sonar readings and a decline of eyewitness sightings. Nonetheless, the villages on the shores of the Inverness-shire loch continue to enjoy the fruits of a tourism industry generated by researchers and curiosity-seekers determined to catch a glimpse of Nessie before she disappears. 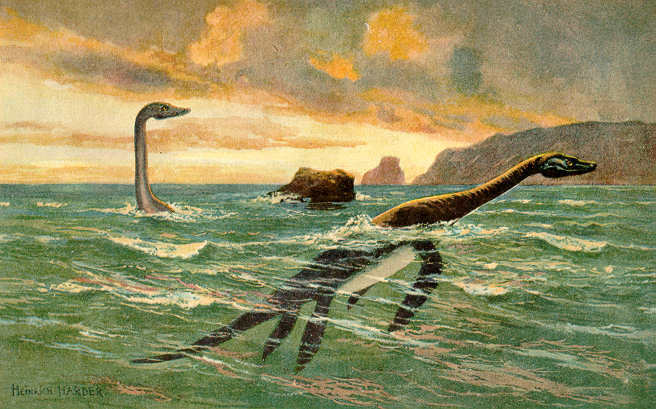 Over the years, eager enthusiasts have often misidentified wakes of birds, felled trees, and migrating seals as the Loch Ness monster. 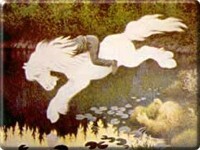 Is this fabled beast simply a modern rendition of the old kelpie legends? Or does an undiscovered plesiosaur-like marine creature inhabit the loch's murky black depths? Consider this: the popular image of the Loch Ness monster bears a striking similarity to a real creature that captured Scotland's attention two hundred years ago, the Stronsay Beast. The body of a huge sea creature washed upon the rocks at Rothiesholm Head on the island of Stronsay in Orkney after a storm in September 1808. Even with a portion of the tail missing, the carcass still measured an enormous 55 feet in length. It was four feet wide with a ten foot circumference and had three pairs of fins. After the Natural History Society of Edinburgh failed to identify it, its members determined that the creature must be a new species of sea serpent. In the 1820s, London anatomist Sir Everard Home decided that the Stronsay Beast was actually a decayed basking shark, as that species can take on a striking plesiosaur-like appearance during decomposition. However, given that the longest recorded basking shark only measured 40 feet long, the Stronsay Beast still remains something of a cryptozoological enigma. Some of its remains are currently stored at the Royal Museum of Scotland in Edinburgh. Years of mounting evidence has proven that there is indeed something lurking in the shadowy deep of Loch Ness. But what that something is remains a mystery. Is it a colossal eel? A mistaken seal? Or an evolved form of the prehistoric plesiosaur? People have been combing the waters of the loch for decades in search of the answer. No one has found it yet.